PPC vs. SEO – Quick Results or Sustainable Effects? Each new service created on the Internet is created while keeping users in mind. A simple web page, blog, or application without visitors loses it’s rationale. In order to attract visitors, many promotional activities should be performed to be noticed. Due to the fact that most of us use search engines to find information, they are used as an essential part of marketing efforts. SEM (Search Engine Marketing) is a broad phrase, which includes a number of activities aiming to promote your website and therefore attract traffic to it. The traffic may be free (organic), generated by the SEO or paid, generated by PPC campaigns. Although both types of activity are used for the same purpose, they differ in their characteristics. SEO (Search Engine Optimization) is a part of these activities that are related to marketing, based on optimizing websites for search engines, in addition to positioning. PPC (Pay Per Click) are activities often associated with tools such as AdWords, which are based on the accounting model, where we pay for each click of our ads. While the concept of PPC as a model of payment refers to the whole area of ​​paid advertising, in the case of search engine marketing, it’s only related to sponsored links. The organic traffic and the paid traffic are independent of each other, but using them together could give your efforts optimal performance. Sponsored links have the form of text ads and appear above, on the side, or below the organic search results. Advertisements are activated by keywords, coherent to the website’s content or the foundation area of your business. Optimization for search engines does not have one form. To achieve your goal, SEO combines a number of tools and techniques that together make up the final result, which is high website position in search engines’ results. SEO is about working on the website’s source code and structure. This also means working on the content. In addition, the website’s position is affected by links placed on other websites. It is worth to mention that this process does not require any technical knowledge (opposed to the optimization). For SEO, the achieved results are long lasting and by the time of completion, they will still generate traffic. It should also be noted that the organic search results are nearly four times more trustworthy than sponsored links. SEO efforts also contribute to building brand awareness and increasing trust among customers. This of course translates into building a greater audience, more frequent purchases and an advantage to your competitors. 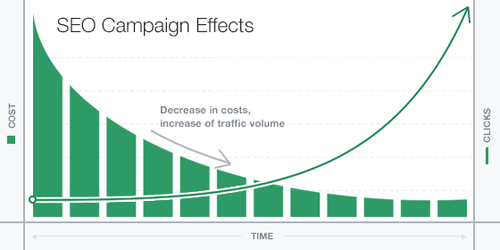 For PPC, the effects of campaigns are immediate, but also, they immediately stop when we decide not to continue them. While we can get results fast for specific phrases from PPC campaigns, getting the results from SEO can take up to several months. Depending on your marketing strategy and it’s objectives, SEO should be considered as a long term investment. You can do many positioning related activities yourself, such as working on the web page’s copy, the publication of valuable content on your blog, or exchanging links with other sites. Costs of positioning, in addition to your own effort, are associated with a single optimization activity, as well as the start of cooperation with the company that offers such services. In the case of sponsored links, the results achieved are related to the capital that we are able to invest in advertising on search engines. 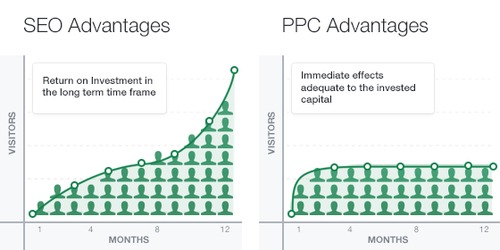 In the long run, comparing PPC and SEO, the second one is a better choice, because it is cheaper and more cost-effective. Choosing PPC and SEO depends entirely on your search engine marketing goals, the time in which you want to achieve them and a budget that you are able to invest in. If your strategy is to achieve immediate results, then you should focus primarily on PPC campaigns. If you have a longer time frame to work with, the preferred solution for you would be to use Search Engine Optimization. Hey Dave, Thanks for stopping by. Like I said above - PPC or sponsored links campaigns bring an immediate results. The targeting for keywords is much more specific and it also gives you a specific knowledge about the actual search queries that brought you the traffic. If you'll achieve the desired rankings, PPC will play second fiddle in your SEM campaigns.